What’s included in a Scheduled Maintenance Contract? All maintenance procedures that are recommended in your New Holland and Kobelco machine operator’s manual are completed at the required intervals. All parts are the same New Holland and Kobelco quality that originally came in your machine. All services are completed by factory trained New Holland and Kobelco technicians. When it’s time for your New Holland or Kobelco machine to be serviced, we’ll contact you to arrange a time and location that’s convenient for you. How Long is a Scheduled Maintenance Contract? You choose the term—up to 5 years or 5,000 hours. 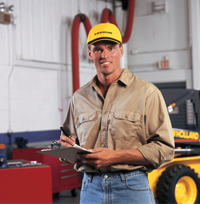 Add your Scheduled Maintenance Contract payment to your financing package on your machine. Charge your Scheduled Maintenance Contract to your CNH Revolving Account for your current machines. Ask about a credit line increase to accommodate your Scheduled Maintenance Contracts. Add a Scheduled Maintenance Contract to your lease agreement.